So… it was all just a big advertisement for the movie, eh? Blood-C #10 — Noooo! Not The Bishie! And the teenage population is now down to Saya, Angsty Bishie, and Pretty Bishie. This is past visceral and just starting to become silly. As usual, nothing of value happened this week until the last couple minutes unless you count the super surprising reveal that… gasp… the whole situation surrounding Saya may be artificially set up. What a shock! 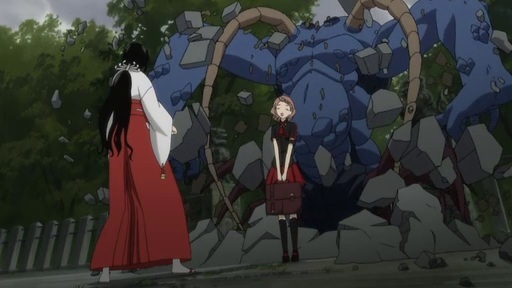 Then the monster showed up at the school and Saya managed to protect a whole… like… six or seven people in her class through her genius strategy of standing still and waiting until the monster got full the episode ended, making this the most lives that she’s saved in battle to date. Although it’s not over yet. There’s still more than enough time next week to keep her record perfect. Aaand, it’s back to normal for the show like almost nothing has happened. Like I said last week, I don’t want Saya to devolve into a crying wreck, but she should show some kind of reaction to seeing two of her friends killed right in front of her… not to mention all those other people. Instead, it’s back talking to dogs about wishes and dreams, remarking on how it wasn’t a dream, having ‘coffee’, and the same crap it’s been doing since week one. I can’t even call it foreshadowing anymore after so long, just chewing up the time. And then it’s on to fight the random monster of the week with all those surprising reveals. Wash, rinse, repeat. Well, she did try to lick it up after vivisecting it. Not terribly exciting, but new at least. Twas a bad day to be a twin. Oh hey, it looks like Bloodsy is finally actually starting to do somewhere. And it only took half the show. Heck, one of her friends even somehow figured out that there’s a monster in the village… in the last five seconds of the episode. At least unless there’s some cabal wandering around mindwiping people, which I give about a 75-90% chance of being the case. Maybe next week I’ll actually pay attention to what’s going on. The show still desperately needs an antagonist or for Saya to at least be challenged/lose in her vampire-mode. It’s getting just a taaaaaaad bit ridiculous at this point how she always goes from competent but losing to an instant kill whenever she turns it on. Well, at least the show’s still good enough for reminding me what a decently animated fight should look like. The other 15 minutes could not be more tedious, and there’s still no weight to any of these fights since they have zero setup and are never mentioned again so the show is still unbearable otherwise though. If Blood-C actually bothered to make these the centerpiece of the show and gave Saya an antagonist instead of fighting random pages ripped out of the Monster Manual, the show would actually be something instead of 3-5 minutes of vapid action and 15-18 minutes of vapid… nothing. FYI, I’m bowing out of Im@s and Blood-C. One still has yet to be decent (and this week was a Yukiho episode about her learning to be brave… ugh) while Blood-C seems content to stick to the exact same goddamn formula every week without any variation. It wasn’t thrilling after one episode, and it’s even less after three. This week, as you can see, the random monster was a trolley hanging around in the middle of nowhere. Who could have possibly thought that was a good idea?